As I took note of the intricate hair arrangements, socks and jewelry for the girls, I was grateful that God had blessed us with a boy! Getting him ready for this was very straightforward! 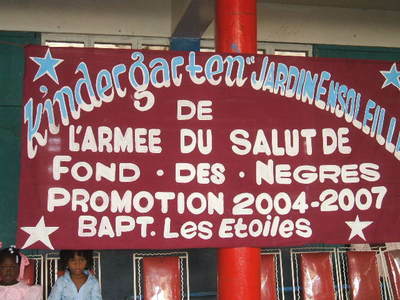 There were 47 out of the 60 kindergarteners that participated in the graduation. 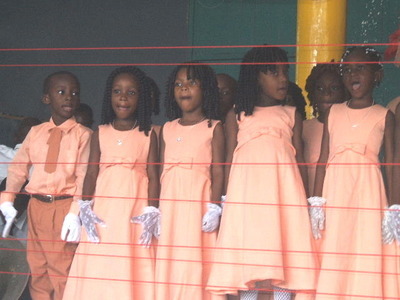 The children performed several songs and individual poems. Matthew did well on his poem, “Les Legumes” (Vegetables). 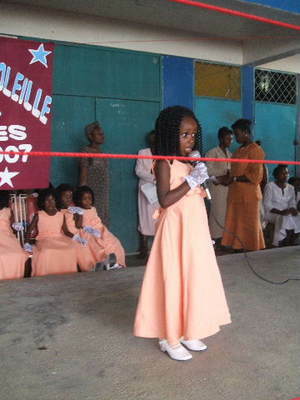 He also sang “Jezi Renmen Tout Timoun Yo/Jesus Loves the Little Children” in Creole and English, which was a big hit. I will try to post the video as soon as I can get it off of Sarah’s camera since my camera doesn’t have a sound feature. will be quite a benefit for future graduating classes! 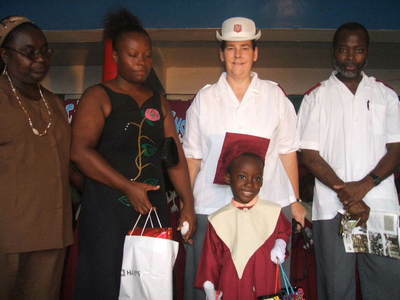 Dedication Marraine, Mme Malbranch, Dad, Grad. 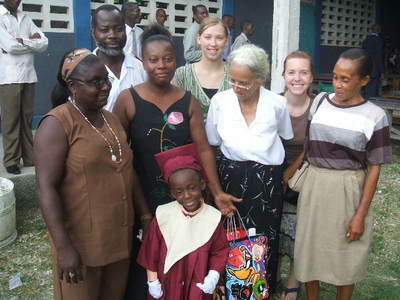 Marraine Gina, Sarah, Maj. Emmi (Nana), Briana, Juzelle (caregiver since birth) with the graduate! Feast for eleven back at the house. 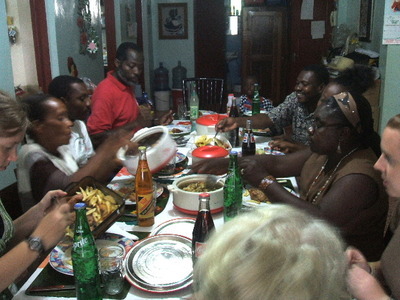 His dedication Parrain (God Father), Dr. Belony is at the end of the table on the right. The two Summer Interns (Sarah and Briana) from TSA USA-C fit right in, cheering him on and helping all things come together. Congratulations Matthew!! 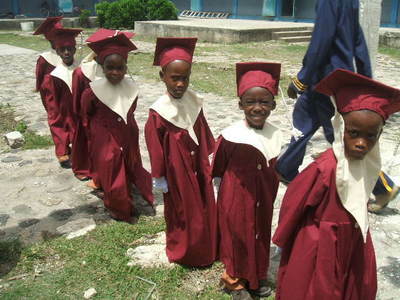 I remember when my children graduated Kindergarten! What a special time! Thanks for posting! He’s so adorable! 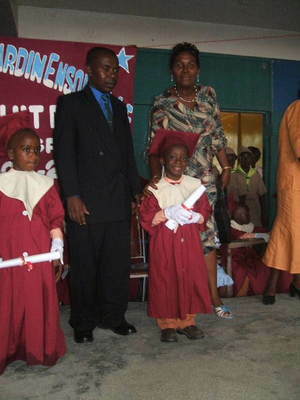 Remember when my kids graduated from kindergarten at Peoria Citadel? 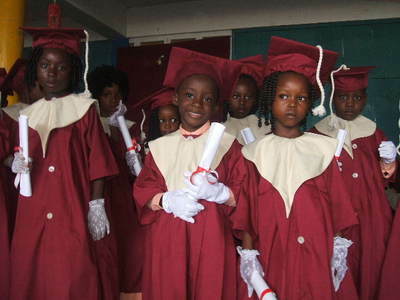 I have their little graduation pictures on my desk at this very moment. Watch out! Before you know it, he’ll be turning 20 like my kindergarten graduate did yesterday. What a beuatiful ceremony and celebration! Congrats to Matthew! What a sneaky friend that mouscellaneous is to tell you its my birthday. anyway…why are there ropes across the stage? Is that so the children won’t fall? Or is it security?